Raw Vegan Persimmon Ice Cream is creamy, delicious, and only takes five minutes to make. It’s a seasonal spin on “Nice Cream” which is vegan ice cream made from frozen bananas. When I first heard about Nice Cream, I was intrigued. Raw, vegan, and easy as hell to make? Count me in. For one reason or another, I didn’t attempt to make it for a full two years. I am officially kicking myself for missing out on all the goodness for so long. Luckily, you don’t have to make the same mistake I did. Seriously! Try this recipe as soon as possible. All you need is a freezer and a food processor. It’s. So. Easy. Place all items in a large food processor or high speed blender. Mix until smooth and creamy. Pour the vegan ice cream into a bowl and top with anything you like! Strawberries, extra persimmon slices, blueberries, blackberries, shredded coconut, pineapple, the possibilities are endless! The persimmon ice cream will be the consistency of soft serve. If you prefer a firmer bowl of goodness, place it in the freezer for an hour or two, then scoop it out like regular ice cream. Enjoy! 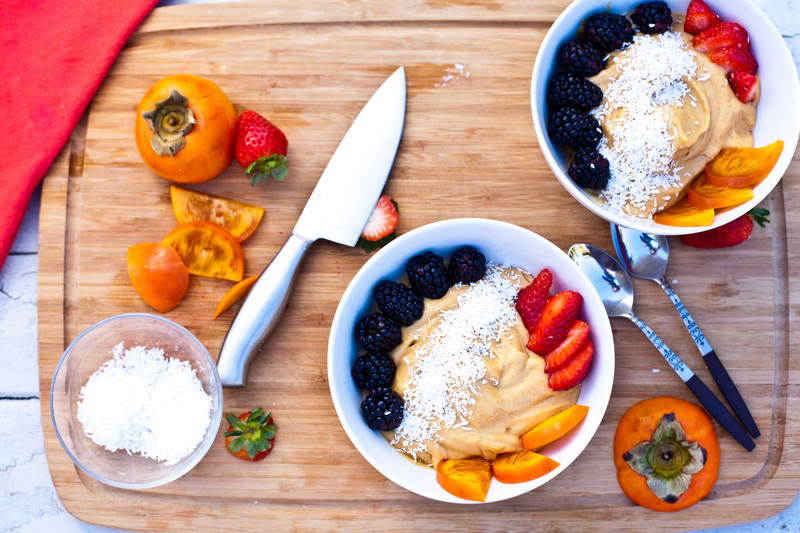 The next time you have a craving for sweets, try making this Raw Vegan Persimmon Ice Cream! Guaranteed to satisfy even the biggest dairy ice cream fan. Make sure you have frozen bananas on hand to make this recipe any time!